The History of Linguistics, to be published in five volumes, aims to provide the reader with an authoritative and comprehensive account of the attitudes to language prevailing in different civilizations and in different periods by examining the very varied development of linguistic thought in the specific social, cultural and religious contexts involved. Issues discussed include the place of language in education, variation and prestige, and approaches to lexical and grammatical description. The authors of the individual chapters are specialists who have analysed the primary sources and produced original syntheses by exploring the linguistic interests and assumptions of particular cultures in their own terms, without seeking to reinterpret them as contributions towards the development of contemporary western conceptions of linguistic science. 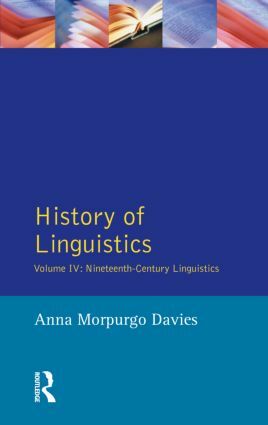 In Volume IV: Nineteenth Century Linguistics, Anna Morpurgo Davies shows how linguistics came into its own as an independent discipline separated from philosophical and literary studies and enjoyed a unique intellectual and institutional success tied to the research ethos of the new universities, until it became a model for other humanistic subjects which aimed at 'scientific status'. The linguistics of the nineteenth century abandons earlier theoretical discussions in favour of a more empirical and historical approach using new methods to compare languages and to investigate their history. The great achievement of this period is the demonstration that languages such as Sanskrit , Latin and English are related and derive from a parent language which is not attested but can be reconstructed. This book discusses in detail the theories developed and the individual findings obtained. In contrast with earlier historiographical trends it denies that the new approach originated entirely from German Romanticism, and highlights a form of continuity with the eighteenth century, while stressing that a deliberate break took place round the 1830s. By the end of the century the results of comparative and historical linguistics had been generally accepted, but it soon became clear that a historical approach could not by itself solve all questions that it raised. At this point the new interest in description and theory which characterizes the twentieth century began to gain prominence.